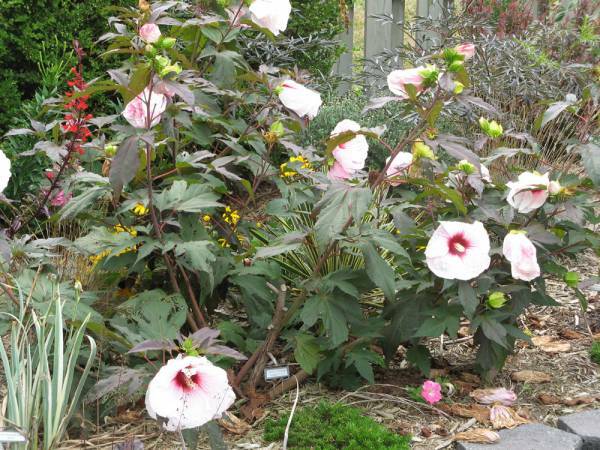 This is a plant with many names, hardy hibiscus, rose mallow, swamp mallow, etc. It is a wonderful plant and should be in almost every garden. A North American native it can be found growing wild in the south, but it has been hybridized and many beautiful cultivars are available for the entire country. It is related to the tropical hibiscus but is hardy and has much larger flowers. These flowers can get to a foot across, a full 12 inches, outside of dahlias, which are a huge labor to grow, what else gets so big? These plants are fairly carefree. They need sun, and water, that is about it. I’ve given some to my Mom and while deer eat most other things I’ve given her, the deer near her house (and she has a lot of deer) have never touched these. Maybe, because they’re native, they evolved with deer and so have defenses. They get a late start in Spring, I often worry they have died (and I sometimes protect them with a styrofoam cone to allow them to get an earlier start, but they don’t need it), by late May they’re growing, reaching as high as 4 feet by late summer, then the blooms come. Mostly in shades of white, red, and pink. The plant also has a very pleasing golden fall color to the leaves. Standard hardy hibiscus have heart shaped leaves like other members of the mallow family. However some hybridizations have occured for leaf interest as well. My favorite of the lot is called ‘Pinot Noir’ it has very deep cut foliage remisicent of a Japanese maple, the leaves are also mottled green and purple, though the purple is very subtle. There is also ‘Kopper King’ which has three lobed leaves like a standard maple that feature a bronze or burgundy sheen. I also grow a variety called ‘Turn of the Century’ that has green leaves otherwise deeply cut like ‘Pinot Noir’ or maybe even more so. ‘Turn of the Century’ also features striped red and white blooms that look like peppermints. Finally I grow a white one that I’m unsure the cultivar of. Of the four I grow ‘Pinor Noir’ my favorite for it’s deep red blooms and colorful leaves, is also the hardiest, and the best grower for me (though perhaps that is my fertilization bias). We had a spat of cold weather about 10 days ago with our first frost. It affected the other ones slightly, but ‘Pinot Noir’ is still sitting pretty like we’re in mid August. In the Spring or early Winter after you’ve had some hard freezes you should prune back the growth to the ground, those canes are dead and you don’t need to keep them (this isn’t a hydrangea). Make sure the plant gets plenty of water when growing, and they should grow well, with plant and bloom size being related to soil fertility. I also have anecdotal evidence they like banana peels, I toss a few into my garden daily, and the plants really seem to respond to that potassium. All told I can’t recommend the plant enough. It is easy to grow, carefree, and provides showstopping blooms. It is also very easy to start from seed, every year one or two volunteers crop up in my garden (enough to be a bonus, way too few to be invasive). After blooming small seed clusters develop which eventually turn brown and crack open, harvest the seeds then and try planting them, maybe you’ll discover a new color! Or perhaps, you’ll just get free plants. Oh wow, I love the Pinot Noir – very different and stunning! I’m building up our Hibiscus collection, with the most unusual being a huge beigy brown colour. How beautiful! I was going to try winter sowing this year. Your Pinot Noir are now on the list. Any idea if those come true from seed? Your description of this variety of hibiscus even reminded me of some of the people I know — carefree, yet hardy and resilient. I have a lot of respect for plants – and people – who can endure less-than-ideal surroundings and still shine on and offer beauty and smiles to those around them. Mother Nature has plenty of “free” lessons, and plants often deliver poignant reminders of how to enjoy the positive aspects of life. I will be getting some of these hibiscus plants from a friend this week and will plant them in my garden. Of course, she is a great reflection of those attributes: strong, tough, beautiful, and always smiling! I too love these, my mom has them in all colors and sizes, she gave me a seedling from a cross pollination that’s a beautiful shade of pink. This year it made tons of little seedlings that I’ll dig up and give out next spring. I also LOVE that the deer don’t eat these, it can be hard to find plants the deer don’t eat when you live in a rural area. Love that copper king leaf, so beautiful. Love hibiscus, never have much luck growing them. Thanks for the advice! Pinot Noir is absolutly amazing. I love the red bright red color. I also have one in my garden. Does anyone know if they have a particular aversion to clay soil? I can provide banana peels as an incentive to grow, but we live in a reclaimed bog — clay soil is pretty much my biggest problem with plants. I purchased the Kopper King early spring and had my first bloom yesterday (June 17th) and already the bloom is closed and looks like its dying. is this the normal? Judy – I had exactly the same problem. My plant was full of buds and they have bloomed, but only one at a time and they each seem to last a day. Can these be divided once established? How? Debbie I have never done so. I imagine you could just cut the root ball in half and hope for the best. I have propagated them from seeds before, and cuttings work well i know though I’ve not done it. I love these plants. They require a bit of water, but that’s about it. Typical of hibiscus that grows in mild winter areas, the blooms last only one day, but they are spectacular. I also like the related rose of sharon bushes that are now surviving in central Iowa which seems to have warmer low temps in winter than it used to. I have always gotten cuttings, and started them in water. When roots form, plant them. Most likely will NOT bloom the first year. Didn’t know I could harvest the seed.. will try that to spread it around! I have a little more information on the Hardy hibiscus. My hardy Hibiscus survived hard freezes this winter 2014 in an insulated pot of my configuration. 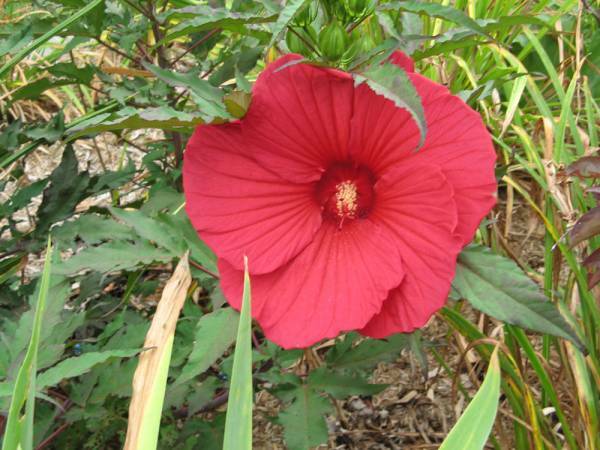 I have many pictures that may be helpful for Hardy hibiscus growers. I live in the Birmingham Alabama area. I propagate the hibiscus by dividing the roots of the plant. The plant you are going to divide should not be heavily fertilized. This will cause the roots to grow together and prevent or make division difficult. My root stock is twenty three years old considering the original plant. I gave away two plants this spring. I will stop fertilizing my plant and just water hoping the roots will dissolve the root mass and become separate tangled roots. I have tried to separate a solid root ball before formed by using lots of miracle grow. The plant was beautiful but the root system was a massive knot. Dividing the roots in the spring is the only method I have used for 23 years. I planted my first Rose Mallow 3 yes ago and am still in awe of its beautiful flowers. The nursery where I purchased the plant said that if they knew how well it would grow they would have charged more (laugh, laugh). I planted it in an area to allow for the suggested size… mistake. My plant has reached 7′ hi x 5’we each year. It is a bright pink and the smallest flower is 8″. I will have to divide it next spring so we can still use our back door. No special growing tips, just lots of water. Forgot to say I live in eastern Ontario….COLD!